The tax burden imposed by the Commonwealth Government alone, and by all Australian governments, is above its historical levels and forecast to go well above these averages. Similar results are obtained if the budget deficit is included to measure the long-run tax burden. In the past when the budget was close to balance, the tax burden was slightly lower than today and spending was much lower. When the tax burden rose above average, governments took significant decisions to alleviate the burden, not stand by and allow it to increase. 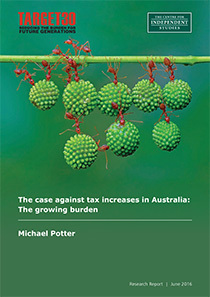 Previous major policies to increase the tax burden have been abandoned. Tax hikes because of tax avoidance would have the largest impact on businesses who pay the most tax and leave the largest tax avoiders unaffected, while actually exacerbating the incentives for avoidance. The structural budget balance shows that the current budget balance and (probably) tax levels are due to government decisions not the state of the economy. Revenue writedowns have major problems: this measure reflects forecasting errors more than anything else and deferring to this measure would lead to large tax increases in recessions. Australia cannot be said to be a low taxing country as IMF and World Bank data says our overall tax level is above the developed world average, while our personal and company tax levels are substantially above international averages. Based on this analysis, Australia does not have a tax revenue problem.